I think the most amazing thing about weeds is the speed in which they grow. I’ve come home from work to find hundreds of dandelions cheerily looking up at me that were seemingly not there when I left in the morning. Usually once a season there will be the perfect amount of rain and sunshine where the weeds shoot up the day after the lawn was cut. It’s a ridiculous contrast between the orderly and the wild. If biff pulls off one arm, how does he pull the other? does he still have control over his emancipated limb? Wait, was the goal here for Biff to rip both of his arms off? Heh, very clever how you’ve used the same picture throughout the week. But still managed to get a different joke out of each. I think Biff is giving Chris an extra hand this week….?vacation? Nice variety in the shirt colors. Happy Memorial Day weekend! What is the sound of one Biff clapping? Ha, nice week Chris. I don’t dislike weeds as much as I should, perhaps, but we don’t have any grass at our house so it’s simpler. But pulling tightly wedged weeds up from the cobblestones is hard! Dandelions are nice looking. if they didn’t grow by themselves, they would be planted for their looks. And aren’t the eyebrow’s the part that is twice as thick as before? He’s changing his shirt often enough but the pants are developing their own personality by now i’m sure. If you water it and it dies, it’s a plant. If you pull it up and it grows back, it’s a weed. Lol, I just opened all 5 comics up and played spots the differences… eyebrows, arms, lines on clothes, thumbs, and of course, colors. Even without the color changes, no two comics are exact. Biff isn’t as lazy as he seemed at first glance… the pants probably were changed too along with his shirt. I never liked weeds. Mainly because I’m the one stooping down with a sharp object digging out the weeds. Here they are all at once. Not quite as mathematically interesting as Dinosaur Comics, but still worthwhile. My backyard actually has no real grass, only wild grass and weeds that flourish in the winter rain, then turn yellow and sprout a million foxtails which my dog loves rolling around in; every summer when I put her out to go to the bathroom, she would always come back with at least half a dozen foxtails that I have to carefully remove from random parts of her body, but I digress. When we finally managed to get our backyard in order last year, we noticed how bad it had gotten; at the far edge of our property, we had one weed that was as big as a human and twice as wide, with roots about as thick as a small tree’s. I’m not joking, here. There’s a similar weed outside of our property line that just grows larger and larger every year. My dad has even told me the “trees” we see at the southern edge of our property line – technically it’s on the opposite side, so we can’t touch them – were actually weeds that just never got tended to. Advice for anyone who hates weeds (and who doesn’t?) there’s a really easy and fairly reliable way to kill them and make them stay dead: pour boiling water on them. 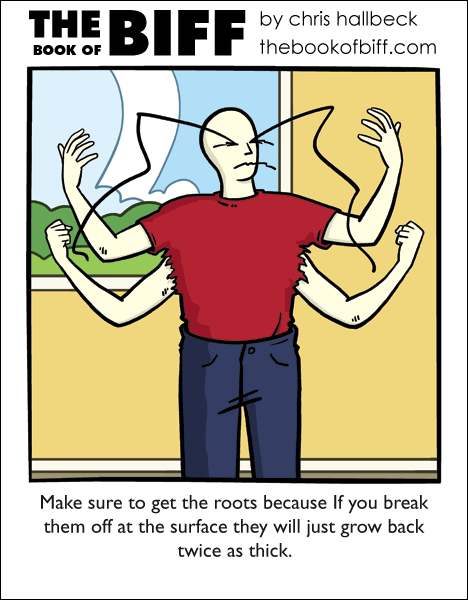 Drawback: if you’re not careful, you can seriously damage the surrounding plants. His arms will grow back twice as thick? Biff could use this to his advantage to get some pretty buff arms! And this one made me laugh as well. This was a very awesome week!